Heavenly blog! : No. 1206: The nefarious website Sokelys continues to discuss the matter between me and Jan Aage Torp most distorted and deceitful just like Manglerud police! No. 1206: The nefarious website Sokelys continues to discuss the matter between me and Jan Aage Torp most distorted and deceitful just like Manglerud police! The nefarious website Sokelys continues to discuss the matter between me and Jan Aage Torp most distorted and deceitful just like Manglerud police! 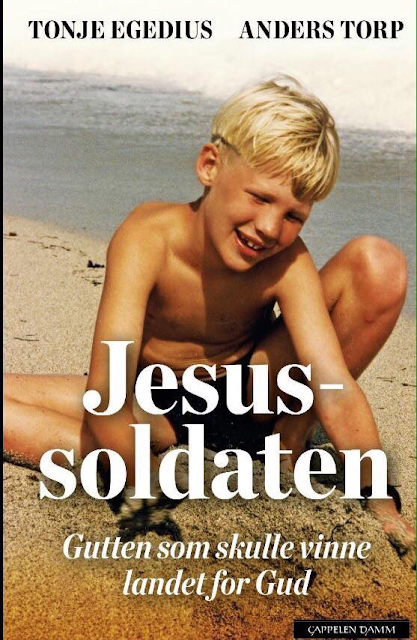 Image of the book of Jan Aage Torp's son Anders. Whenever Torp writes disparagingly about what is written here, so he writes really derogatory about themselves. have harassed pastor Jan Aage Torp hundreds of times with characteristics as "whore buck", "psychopath", "narcissist" and numerous other epithets not usually found on a Christian blog. This is more a distortion, it is really a lie the whole thing when it says such without regard to other facts of the case. Word. 18. 17 He that is first in a straight fight, seems to be right; but his neighbor cometh and searcheth him. I have written what I have written votes for sure. But if the number is important, as there are several things to mention. 1.) I've actually written or black on their blog at over 10,000 hatmeldigner directed against me by Jan Aage Torp and his lackeys and poodles. 2.) 99% of what I have written against January Aage Torp, written after his fictional review of me. 3.) In other words, everything that Searchlight, police and Torp writes against me are nothing but fabricated lies! 4.) Andersen writes: "a number of other epithets not usually found on a Christian blog." What has been written in Searchlight, at Torp many forums and the false Smyrna blog surpasses me 1 Million times where the goal they write was that I should have a noose around the neck and then the process towards me over. In other words, MY DEATH IS JAN AAGE TORPS SUPPORTERS AND "FRIENDS" AGENDA AND GOALS! January Aage Torp do not understand a single thing how things fit together in a Pastors, father and shepherd's role and function. We see that Jan Aage Torp has several months. attacked his own son in such ufin way that is difficult and uncomfortable to comment. But as a father and a priest in the family then there is only one person responsible for what happens to the children, it is above all the priest at home - father. When Torp attacking his own son, so it is really an attack on himself and what he stands for, etc. "Deliver writing in the book ..."
Then there is no dialogue Torp doing, but monologue! Not some people commenting on Torps many blogs and not a single serious Norwegian preacher who supports him. Only support he has is in Manglerud police, the nefarious website Searchlight and in the false Smyrna blog being run by the two largest and worst net roll. It is Torodd Fuglesteg and Ansgar Braut who writes under the pseudonym name. In other words, what the counterpart has committed to me is a thousand times more (in number of messages) and worse! We are, in other words to Norges history not the worst, but greatest miscarriage of justice when the counterparty here has surpassed me a thousand times if it is so that I straddle and speeches is criminal! Here are some links that you can read more about what is written and spoken on this matter.